We like the creedsâ€¦.except for the catholic parts. Thatâ€™s because we knew they were trouble. And I know why. Letâ€™s journey back to my youth among the Landmark version of Southern Baptists, a common variety in Kentucky in the 50â€²s and beyond, even to this day. The anti-Roman Catholicism in my SBC upbringing extended to a general suspicion that â€œcreedsâ€ were instruments of Roman Catholic superstition. So while we were devoted to the King James Bible, the 1956 Baptist Hymnal and Southern Baptist Sunday School literature, the great creeds of the church could take a hike. A long hike. If, however, by some strange circumstance, these two creeds were to somehow have found themselves used in worship or teaching, and our people had been able to hold them in their hands and see the words for themselvesâ€¦.they would have not been happy. â€œCatholic.â€ That word. The â€œc-word.â€ The word that must be explained a thousand times. The word that is so much trouble, some have reworded those lines of the creeds to avoid the controversy. Itâ€™s not just in Baptist circlesâ€¦or in conservative evangelical circles, for that matter. Iâ€™ve had to explain the term â€œcatholic churchâ€ to almost every visitor who has ever come to my church. (Yesâ€¦mostly Baptists.) They listen and nod, but I donâ€™t think my explanation does much good. Given the choice of â€œNo creed but Christ,â€ or â€œWe believe the Apostleâ€™s/Nicene Creeds,â€ the majority of Christians in my environment would have no trouble choosing door number one. The Apostleâ€™s Creed and the Nicene Creed were never going to surface in my Baptist circles, because the language of those creeds defined the church in a way that opened all sorts of difficulties for people who believed that the church was their local congregation, and local congregations just like them. The Campbellites (Church of Christ) and the Roman Catholics would engage us Baptists in debate about which church was the â€œone, trueâ€ church Jesus founded. Landmark theology allowed my church to give an answer: the true church was the church that had the New Testament marks of the church. What were the marks of a true church? Its ordinances, only two, Baptism and the Lordâ€™s Supper. They are typical and memorial, not saving. The various churchesâ€“separate and independent in their execution of laws and discipline and in their responsibilities to Godâ€“but cooperative in work. What these distinguishing marks did was very good. What they did not do, however, was address two issues raised in the creeds and in our interactions with other Christians. First, what is the â€œuniversal,â€ or â€œcatholicâ€ church? The invisible, one body of Christ through all time and history? Is there such a thing? How does this universal church relate to the local church? Are they identical? Particularly, how does membership in the universal church relate to membership in the local church? It appeared quite possible to my Baptist friends that if one admitted that the Methodist pastor was a member of the true body of Christ, then the local Baptist churchâ€™s claim to being the â€œtrueâ€ church in the above list was compromised. Here was someone who was accepted by Christ, but unacceptable to our local congregation. This eventually came to mean something else; something that was said, not loudly, but plainly: our church, the Baptist congregation, was the one, true church that Jesus founded, and other churches wereâ€¦wereâ€¦wellâ€¦. This was the second issueâ€”What were other churches? The Roman Catholic Church was the whore of Rome and the home of the future anti-Christ. But what about the Methodists? Pentecostals? Presbyterians? Our church was straightforward. These other congregations were not churches. They were â€œreligious societies,â€ and the persons in them were, generally, lost, or at least so confused and poorly taught that you should approach them as unbelievers and seek to get them saved. One, holy, catholic, apostolic church? Such a concept played no part in our church at all. Our church was the church. Our denomination was not a church. There was no invisible, universal church. There was a New Testament list of the characteristics of local congregations, and our church had them all. No other church did. Now a majority of trustees of the IMB and an increasing number of conservative SBC leaders are ready to move the SBC back toward the atmosphere and claims of my youth among the Landmarkers, where you were about as likely to hear a sermon on the â€œcatholicâ€ church as you were to hear a list of the pastorâ€™s favorite beers. Today, these advocates are prepared to say that those not baptized in a Baptist church that believes in â€œeternal securityâ€ (i.e. any Arminian/Charismatic/independent church) and ties that endorsement explicitly to baptism have not been baptized legitimately and must be rebaptized. They are prepared to say that baptism is an endorsement of an entire slate of conservative Baptist theological positions, and any church that falls short of those commitments is not providing a legitimate Baptism. They are prepared to say that there is no legitimate Christian church, no Christian baptism and no Christian ministry outside of what is practiced by non-Arminian Baptists in local churches. They are prepared to, once again, emphasize an understanding of the church that will never be disturbed by the question of the one, holy, catholic and apostolic church existing outside the distinctives of contemporary conservative Southern Baptists. I will not roll call the names of the churches, ministers and fellow Christians whose legitimacy in the Body of Christ will be rejected by this shift. Most Baptists are not interested in a return to the catholic Christianity of the creeds. I am well aware of this. They will stand side by side with brothers and sisters in the cause of the contemporary culture war, but they have no interest in seeing the church itself in larger, more catholic terms. What does this mean? It means that, for all intents and purposes, until someone comes to a Baptist congregation, walks a Baptist aisle, is immersed in Baptist water by a Baptist minister, they will not be accepted as one who is legitimately part of the Body of Christ. It may take a while for this to be revealed, but it is the case. I have no quarrel with those who derive a â€œlistâ€ of New Testament church characteristics from the Bible and seek to live by those. But I do reject the notion that our churches are so right, so correct and so in conformity to scripture that we can pronounce other churches, baptisms and ministers as merely â€œreligious societies.â€ Rejecting those who profess faith in Christ and seek to follow him as I do is a serious business, and I am unsure why we seem to be relishing the opportunity to do more of it. In other words, we need a â€œgenerous catholicity.â€ Not a competition where the winner plays the role of the brat, but a humble and sincere attempt to see Christ in his church, and not just in ours. It will not hurt us to say that Christâ€™s church is larger than our own, or to act like it. We differ on how we profess our faith. Can we agree that we receive a brother in Jesus nameâ€™ and not our own? We differ on the Lordâ€™s Table. Can we agree that all of us read the same texts with the same passion to be connected to Christ through that table, and that even if we cannot share it together, we can agree that it is our table, and the table where our elder brother seats us all in places of honor? We differ on much and always will. Can we agree that we are allâ€¦all of usâ€¦the church catholic? The one, holy, apostolic, blood-bought, inheritance of Jesus? That we are all the fruit of his incarnation and suffering, and that our divisions do not divide Christ (I Corinthians 1:13), but only ourselves from our family? I am glad for all the Baptist tradition gave to me and to my family, but if my Southern Baptist brothers are going to all but erase the â€œcatholicâ€ church from our common faith, I will pray that the project fails and that God will raise up a better generation, with a deeper love for all the church. Seriously? How the church was funded was one of the marks? I’ve never heard the Peter’s Pence collection characterised like that. So if (for instance) the church raised money by raffles (oh – okay, that’s gambling/games of chance and so wrong) or jumble sales, it was not a true church? Sorry. A few of you received a “sneak preview” of this post. I put the wrong date when scheduling it and it came up Fri instead of Sat. No, you aren’t crazy, it really was there for a short time! Yeah, I kind of wondered when it vanished. Oh, well: I forgot to wish everyone a holy Feast of the Transfiguration for Friday, anyways! I love the bullet points at the end and their emphasis on the Church belonging to jesus and not to us. Very profound. Years ago, I mentioned to the head pastor of my independent evangelical church that every church was wrong about 10% of its beliefs. He was quick to ask me which 10% we were wrong about; I said I was too close to the church to recognize. Now I could tell him — but why? As I said, we’re all wrong 10%, and that includes me. It would be great if we could be accepting of other despite differences, but that won’t happen, I’m guessing, until sometime in Rev 21. Given that, let’s just pray on/work on accepting those brothers and sisters who deny us. I gotta admit…Easily half the time I come on this site, be it posters or commenters, I can’t quite figure out where all the “bad churches” everyone’s mentioned have come from. It’s a little baffling to me. But that’s me. Um, this was only semi-on topic, but ah well. It was here or the Beth Moore one. I love how on this site all Baptists, especially Southern Baptists, get lumped into some kind of holier than thou moronic grouping. We are not all like that. Seems like you are against divisiveness in the body of Christ and yet you alienate those who don’t agree with you. I’m thankful for your thoughtful posts, but they generalize way too much for my taste. I think that’s fair. It’s wrong to stereotype. But many people who were baptized as infants, like my wife, have a lot of baggage from being told as children they are going to hell by Baptists because they aren’t saved. So we shouldn’t stereotype and lump all Baptists together, true, but on the other hand they do tend to lump all us non-Baptists into the un-saved, hell-bound category. I don’t. But your beef is not with me, I understand. It’s with “the others”. I was raised a baptist most of my life. I can relate to the idea its baptist or its wrong because that is what I was taught. Recently, I visited another church that had the Apostle’s Creed and it didn’t bother me to say the Catholic church. Their whole service was focused on God. A vast majority of churches has lost sight about what church is about. It’s not about being seen on Sunday morning or which church you go to but about worshiping God, the one who died for our sins, but deprived man can not get passed the “being right” mode to worship God with other believers in one accord. I grew up in a creedal church (Protestant) that said the Apostle’s Creed every single Sunday, with the words “holy catholic church.” My husband grew up in a non-creedal church (Baptist) and never said the Apostle’s Creed. He tends to question the creeds (Apostle’s and Nicene) because in his mind, they might not agree totally with the Bible. I don’t question the creeds because in my mind, they define Christianity and what the Bible teaches. But it just kills me that when on occasion our church says the Apostle’s Creed, they change the words from “holy catholic church” to “holy Christian church,” because some people might think the creed actually means the Roman Catholic Church. So to keep that from happening, they say something that makes no sense: “holy Christian church.” Really, how can a church not be Christian? Why change the wording? (And believe me, I mean no disrespect to the Catholic Church). But what gives us the liberty to go around changing the words of these historic creeds of the church? The Creed does mean the Roman Catholic Church. Other churches are wrong to appropriate the Creed for themselves and their own use and interpretation. The creed was instituted to describe orthodox belief at the time it was written — and forever — and to define the Church apart from those who were going their own way and creating belief systems in their own image. As a convert to RC, I get queasy when I visit a Protestant congregation reciting the Creed with word changes. Why do that? If you want to say it without word changes, the recitation is more meaningful and true if one actually believes it. How can it mean the Roman Catholic Church? Doesn’t the apostle’s creed predate Constantine’s sword? We will probably disagree on this one, but Protestants can substantially argue their use of the creeds based on a good historical account that the church was not yet Roman in the second century. We probably will disagree. But at the time there were not 5 or 50 or 1500 North American style protestant groups about defining themselves apart from one another. The Creeds came more than a thousand years before anyone began raising what came to be protestant disputes with the Church and before an agreed upon set of scriptures was formed that have become what we know as the New Testament. (A long and fascinating story in itself.) What was in place beginning during the latter years of the Apostles themselves were groups of hierarchically organized churches led by bishops, circulating letters and writings, debating among themselves and, after having been booted out of Palestine, looking to leaders in Rome to referee the disputes. The Creeds came more than a thousand years before anyone began raising what came to be protestant disputes with the Church and before an agreed upon set of scriptures was formed that have become what we know as the New Testament. If David Trobisch’s thesis in his books and articles, including THE FIRST EDITION OF THE NEW TESTAMENT, is correct, then the New Testament predated the Creeds by a century or two. If he’s correct, then NT studies will undergo a seismic shift. Wow. The Eastern Orthodox churches would disagree, since, by your own standard (“The creed was instituted to describe orthodox belief at the time it was written â€” and forever â€” and to define the Church…”) they would certainly qualify. You are certainly correct; they, the “O”, would disagree. You have made the point of my argument much more clearly than I have. We pray for the unity again of East and West. Dude, I’m pretty sure the RCC lifted the excommunication of 1054 and recognized the Orthodox as “churches”. “Catholic” in that creed is opposed to stuff like Arianism, Donatism, etc. I personally have no problem using “holy catholic church” either, and would rather it wasn’t changed. But in this age of sound-bite theology I can see why people would have difficulty with it, and would be impatient with something that had to be explained. So instead of “Christian,” why not use the word that is the very definition of “catholic;” which is “universal.” After all, when we say use the phrase “holy catholic church” aren’t we really saying “holy universal church?” So if we’re going to change it let’s just say it in more modern language, using a word that means the same thing but doesn’t have the baggage that “catholic” does. It’s always bugged me when churches refuse to be ecumenical. Especially the ones who claim to be the “one true church” and the “true keepers of the flame.” I’ve agonized for too long with a Paschal’s wager type delima: If Rome is right, I’d better get in. If the SBC is right, I’d better not leave, etc…. Jesus didn’t open a franchise. The only conclusion I’ve been able to come to is that none of them can be right. There is Christ outside EVERY church that claims exclusivity. All I can say is that I simply have no desire to be a part of a Church that will not recognize other forms of Christianity within at least some generous framework of basic theological guidelines (trinity, divinity of Christ, etc…). It’s pure arrogance to suggest that because these people worship this way or have this polity then they stand a high chance of burning in hell….. When I hear a church talk like that, I feel like it may be the last place on earth I’m gonna find Christ. What unites us, on the foundational level, is so immensely more crucial than the petty semantics and perspectives that divide us, and if we will not recognize that, then there is a serious priority problem. The Church IS one, or else there is a prayer that God the Father did not answer for His Son, or Jesus prayed incorrectly. Yeah, this bugs me a lot too, and it goes deeper, to something Michael mentioned above in his post. If there is a “one true church” (that isn’t the SBC) and if redeeming/sanctifying grace is only available through it, the logical conclusion is that my entire Christian life has been a series of lies, delusions, and hallucinations. Why would God draw me to Christ outside of his Church but deny me his redeeming grace? Was my subsequent regeneration an illusion? Has this road of sanctification since been a futile effort of my own and not the work of God in me? It quickly becomes insulting, and I’ve got enough anti-theists trying to tell me that my faith is nothing but make believe; I really don’t need fellow Christians telling me the same thing. I’ve also become convinced that no matter where we are, we shouldn’t be so arrogant as to think we don’t have something to learn from the other branches of Christianity. We’re really incomplete as a Church without the others to round us out, though some of us are definitely more incomplete than others. A broken Church is our current reality, even if this is a “new” development. God revealed Himself to Moses as “I Am Who I Am” — which I take to mean that He is a person who completely transcends human definitions and understanding and who will never fit completely into any box we try to stuff Him into, be it a box of religious traditions or theological constructs. We can manufacture all kinds of religous and theological stuff that lines up with who we think He is (or who we want Him to be), but, at the end of the day, our opinions, beliefs, and religious traditions have no power to alter or bind Him in any way. He would continue being exactly who He is even if every single person on the planet whole-heartedly believed wrongly about Him for a billion years without deviation. All that is little more than saying that God created us in His image, and, though we have certainly tried throughout history, we will never successfully mold God into our image. In the same sense, I believe His church “is what it is” — meaning that the church consists of what and who Christ percieves His church to be, nothing more and nothing less. We can place as many limitations, definitions, or requirements on it as we want — or we can water it down to mean nothing more than those who believe in a higher power — but if our stipulations and definitions don’t line up with how Jesus sees and defines His church, then they’re just a bunch of meaningless manmade stuff, void of authority or truth. And it doesn’t matter if it is by papal decree, denominational convention, popular vote, or some self-styled prophet’s supposed revelation that we define the church and set it’s boundaries — if we don’t set our measuring rods and boundary markers where Jesus sets His, then we’re either being too small and exclusive or too broad and inclusive in our various definitions of the church. So how does Jesus define His church, and how can we know what that definition is? He said that His followers would be recognized by their extreme love and devotion to each other. He said that His sheep know His voice and follow where He leads them. And when religious people tried to narrow that defintion down to the confines of Judaism, Jesus said that He has sheep that are not of that flock. The word he chose for his church — which, in both Greek and Hebrew, basically means nothing more complex than any gathering of people with a common purpose — should give us a clue. He also said that even when no more than two or three people are gathered together in His name that He would be there too. Could it be that people gathered in His name, plus the presence of His Spirit, equals His church? Could it really be that simple? I tend to think so. If it’s really that simple……Why don’t I feel all warm and fuzzy about the Mormons, Jehovah Witnesses and Joel Osteen being part of one, holy, catholic and apostolic church? … because they don’t have the Holy Spirit? ….and this implication leads us to conclude…? …they’re not past of the Church? So if they’re out, whose in? Who am I kidding? I have no idea. Maybe those who accept the Apostles creed? Perhaps my earlier comments are simply arrogant. I just don’t have a clue who’s in right now, but I certainly hope it includes me. I agree. I believe it is that simple. I also believe that all of the divisions and denominations are wrong. Christians are one in Christ. There are no divisions in Christ only in man. Yes. And the more we focus on Christ — His teachings, His character, His example, His odedience unto death, His resurrection, and the indwelling of His Spirit within us — the more unity we will have within the church universal. That’s because He insists on being both the mortar that binds His living stones together and the hand that places them according to His plan for a living temple and suitabe dwelling place for Himself. However, if we continue to focus on other things — such as splitting doctrinal hairs, engaging in cultural wars, militantly defending man-made traditions, and zealously promoting certain styles of worship or ecclessiological structures — then I fear unity will continue to evade us. I love the thought of the Church Universal. It is the only church I really feel I’m a part of. No, neither Catholics nor Protestants (at least, the Reformers) defined the church that way. The definitions differ, but what you wrote could just be a Bible study. There has to be some structure. But not to start another debate. As to what Tom the Catholic said, I think that’s a good reason not to change the words of the creeds. We can’t even consider the actual possibilities of what the words really might mean if we change the words. The words “holy catholic church” should not be changed, even if Protestants define the words differently. At least there’s the possibility that people might think about what the words might have originally meant, and maybe still mean. I know that “catholic” means “universal,” but I would have to think about using that word, because historically, the word “catholic” has always been used. Why would it have to be just a Bible study? Why not a gathering devoted to prayer? Why not a time of open sharing of those things that God has been doing in our lives or what the Spirit has been speaking to our hearts? Why not people working together under Christ to renovate a single mother’s home or do yard work for someone who is elderly or sick? Why not simply enjoying the fellowship of fellow believers and sharing meals together? And, sure, why not recite the creeds or observe the Eucharist or sing hymns or worship songs or listen to sermons? As far as I’m concerned, it’s all good, and it’s all of God — if Christ is both the inspiration and active head of it. This morning, most of the members of my home church family visited a more traditonal, denominational church to witness the baptism of a young woman to whom both our church fellowships have ties and in whom both have invested in her spiritual formation. We worshipped and fellowshipped together, not as two churches in the same building, but as a single body united in Christ. And during the baptism, we were unified in our joy and thanksgiving (right along with the angels of heaven) over a soul saved and the beginning of a new life in Christ. Rebecca, if you insist on limiting your definition of the church to a particular tradition with a particular institutional structure, a particular historical pedigree, and a particular list of practices, doctrines, and sacred cows — then nothing I say is likely to change your mind. As for myself, the more experiences I have in Christ and with fellow believers, the more scripture I read, and the more I study church history in all its variations, victories, and failures, the less able I am to subscribe to these narrow, sola-institutional definitions of the church. I hate to disappoint our Catholic friend, but the Roman Catholic church cannot claim exclusivity on the creeds. The creeds are part of the DNA of all Christians which is why the only people that object to them are non-trinitarians such as Jehovah’s Wittnesses. For a R. Catholic to exclusively claim the creed is like me telling a cousin I have distinct claim to a distant common grandmother and he does not. For a Baptist or Evangelical to say the creed has nothing to do with them is like me denying to a cousin that I am descended from a distant common grandmother. The apostles Creed is believed to have been started as a baptismal confession in the early church. And that early church which wrote them was . . . . (or more accurately) is … which one? You use an excellent metaphor. The Creeds are the DNA of every Christian. I am thrilled by the posts that show such a hunger to claim them and a that there is a growing desire to adhere to them. Ron, I don’t think I was limiting my definition of the church to a particular tradition, as I specifically said that neither Catholics nor Protestants would define the church the way you did. I don’t think there are any other traditions other than the Orthodox or some cults. (And I am not trying to equate those two, by any means). The Catholic definition of the church is that it is: one, holy, catholic, and apostolic. The Protestant Reformers defined the church as the institution which: preached the gospel, practiced the sacraments of baptism and communion, and had discipline/government. That’s why I said that what you were describing would be better known as a Bible study. Christians can certainly get together and do many wonderful things together, but every time they get together, you do not have a gathering which would constitute a “church.” I didn’t define the church – I am just sharing the only two definitions that I have ever heard. But I see the problem as you are commenting, and that is that as Protestantism has continued for 500 years, people have decided that they can define things and decide theological points basically any way that they want to. They will usually use the Bible to back up their claims or points, but everybody does that. What gives you the right to define the church in a way that it was never historically defined, either by Catholics or Protestants? I don’t mean to be rude; I think you are doing what everybody does. But it is one thing to have a gathering that includes members of the Body of Christ; it is another thing to have an actual, visible church gathering. Was the early church in Jerusalem still fully the church while they were sharing meals “from house to house” or camping out on Solomon’s Porch in the temple or getting together at various times, various places, and in various numbers to pray or fellowship or listen to one or more of the apostles teach them about Jesus, His works, and His teachings? Were they still fully the church while they were working at various jobs or sleeping in their beds at night? I think there is plenty of evidence, both in NT scripture and other historical sources, that the church’s earliest perception and definition of itself was more that of a community, an extended spiritual family, and a new way of living than as an institution with a precise organizational and governmental structure. Of course, even that first church soon developed some necessary organizational and governmental structure, but the overwhelming emphasis of the apostles and other NT writers seems to have been on maintaining the purity of the gospel and establishing communities of believers where the teachings and character of Christ and the real direction of the Holy Spirit was lived out in every aspect of life. But, for good or ill, church history went the way that it did, and as numbers and outside pressures and threats increased, the church defensively adopted more and more trappings of institution, until it came to perceive itself primarily along institutional lines. While that was all very natural and understandable (perhaps even inevitable), I think the real departure from truth began when the church started presenting and promoting these institutional constructs as sacred and inseperable from the true Body of Christ. And then Constantine took this well-developed structure, tweeked it a little, and turned it into a religious branch of the Roman government. Of course, this is all just my own subjective take on early church history, and where I see a departure from original intent, many more see the Holy Spirit guiding the church from simple, somewhat disorganized beginnings to the full institutional stature of God’s design. Don’t get me wrong, it’s not that I think the influence of the Holy Spirit has been absent from church history — I just think other forces have been in play, as well, and that the historical reality of what has emerged over the centuries, in both Catholicism and Protestantism, is a mixed bag of God’s designs and a lot of imperfect, fallen human stuff. And I’m not opposed to institutional church — but I do believe that much of what the church was originally designed and intended to be has been buried and lost under a heaping pile of institutional baggage. I may very well be wrong in my definition of church — though I feel strongly that the church is something that we “are” collectively as believers, rather than a place we “go” or services we attend or a religious club of which we are members. And I stand by my assertion that, regardless of how we variously define church, the true definition of the church ultimately exists in the mind of the one who founded it and who still rules over it. We use the word “church” in too many ways — it’s hard to achieve clarity. I think RonP is using the word to indicate the people who make up the Body of Christ, while Rebecca is talking about the central “work” that is done for, with, and by the Body of Christ, that is, the sacraments and liturgy of the Word. It’s certainly possible that the church/Body of Christ can have prayer meetings or even yard sales and still be the church/body of Christ; but they are not doing the work of the church at that time. The danger with this confusion is that there are many gatherings who call themselves the church who never do the work of the church. There are people who haven’t been to real church in years but only attended concerts, parties, and fundraisers on Sunday morning. “the churchâ€™s earliest perception and definition of itself was more that of a community, an extended spiritual family, and a new way of living than as an institution with a precise organizational and governmental structure”. Ron, a precise organizational structure is precisely what the early church did have; if you read Eusebius’s The Church History, you might be surprised, as I was. 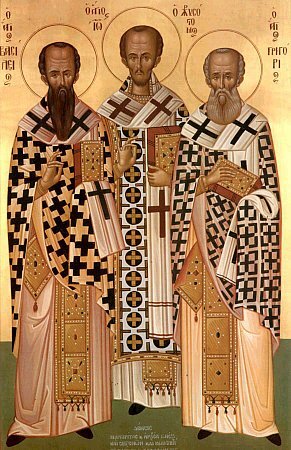 James was the first bishop of Jerusalem; John was the first bishop of Ephesus. You are looking at the church through 21st century eyes, and reading that back into church history. If you actually read early church history, you will get an entirely different picture of the early church and even of scripture. It is important to read scripture in context. Your picture of how things changed over time with the church is a common Evangelical understanding, but I think, after reading early church history and medieval history, that it is a flawed understanding, based on just not having a really good idea of the facts from such a long time ago. But you are right that members of the body of Christ can get together anytime and do many good things; I am just saying that anytime they get together does not constitute a “church.” There has to be an authority structure and sacraments to have a church, at the very least. No there does NOT have to be an authority structure and sacraments, or at least not one like it has become. Those were later concepts the church adopted and hardened into doctrines (esp. the idea of “sacraments” – a misuse of the Greek musterion). RonP is largely if not absolutely right. Eusebius isn’t exactly an objective and unbiased source, interesting and valuable as he may be (and is). And those who impose the modern-day or even 4th-century idea/concept of, e.g., “bishop” into or onto Eusebius’ statements are also viewing history through distorted lenses. And, yes, I’ve read church history – Pelikan, Ferguson, the Apostolic Fathers, Bradshaw, Dix, Chadwick, etc. Thank you, Eric, for taking up for me — and thank you, Rebecca, for the honest, intelligent feedback and discussion. And I hope that all of you will pardon me for being such an odd ball and challenging and questioning everything under the sun. Maybe Christ will guide me into a more moderate wisdom as I get older. It’s just that when I read about Christ and His teaching, the teachings of the apostles, and the life of the NT church — and then I read about the church history that unfolded in the centuries between then and now, and I look and see the state of current church institutions –I feel a great (to borrow a term from the late, great Michael Spencer) “disconnect” between how the church began and what it has become. I sense deep down that something has gone awry or that something important has been lost or forgotten. And there’s just something about Christ, His words, and His deeds that makes me wonder whether or not He came to establish a religious institution. He seemed to be relaying a level of truth that transcended, not just the Judaism of His people, but all human religions, instittions, and even human reason itself. Primarily, I think He was trying to teach us about His kind of love and how, through Him, we can actually live in His love and let that love rule and guide our relationships with other people. Maybe that has something to do with why he instructed his followers to continue to “gather” in His name, even after He had returned to His Father. Maybe He intended such “gatherings” to be a social support structure and training ground where people could minister to and teach others in the same way that He had discipled His followers during His earthly ministry. And maybe He intended for His church to be a source of divine contagion, from which the whole world would be infected — not with the trappings of religion or institutional structures or complex theological contructs — but with His love. I so enjoyed your several comments here in this thread that I shared all of them (actually links to them) with my Facebook friends today! Ron, you have a lot of good thoughts. Eric, I think the church has to have an authority structure because of the scriptural mandates for church discipline and teaching, which require authority. I’ve enjoyed the discussion. I don’t totally disagree with authority. I just don’t see what it’s become as being what Jesus and Paul envisioned. Unfortunately, that’s not as clear as it could be. Yes, we have terms like overseer, elder, deacon, etc., but they’ve become ossified and classified and stratified. Okay, enough paleontology. It would appear that lack of adherence and rebellion to authority, that is so wonderfully prescribed in the Creeds, is what has resulted in Christianity offering the smorgasbord of options it now displays. If Jesus proclaimed a desired structure, and Paul complemented it, (Mt 16:17-19; I Corr 14:11-13 ) could this fractured body be what Jesus prayed for? The Creeds are valuable and essential for a living and loving Church. The more we rely on the Creeds as our institutional and character guides, the more effective and joy-full the body of believers we will be. But as I think about the Catholic and Orthodox and Anglican Christians and churches I know, they don’t seem to be more luminously and exuberantly joyful believers or groups of believers than non-Creedal churches and Christians. Maybe being shaped by Jesus, rather than a Creed, is the secret to the effective and joyful life as a believer.